Long recognised as the pre-eminent authority on women's leadership, the Simmons Leadership Conference is coming to Dublin, Ireland on November 13-14, 2018. This year's conference theme, Disrupt the Ordinary, centres on the need to change how we think, behave, and do business in an era of accelerating innovation. In between formal sessions are chances to meet the speakers at a book-signing break, visit the corporate marketplace, enjoy delicious meals, and network with some of the 500 women executives attending the conference from companies and organisations around the world. 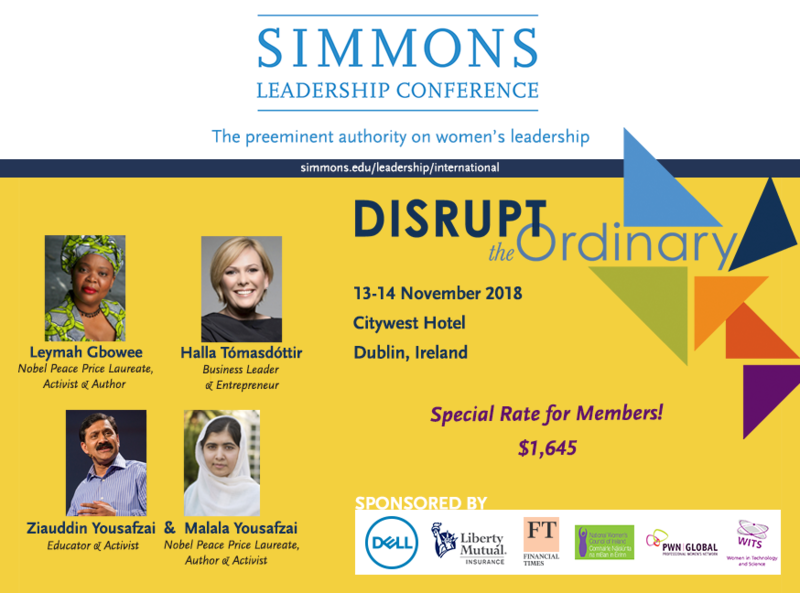 PWN Dublin is partnering with Simmons Leadership Conference this year and can offer all our members and users a $100 discount. Use Discount code PWN10 for $100 off the registration fee. NOTE THIS EVENT IS NOW FULLY SOLD OUT - SEE BELOW FOR YOUR LAST CHANCE TO GET A TICKET! All proceeds support graduate student scholarships at Simmons College. Would you like to win a ticket to this incredible event? We have one ticket worth $1645 up for grabs! To enter you need to be a member of PWN or work for a company that has a corporate partnership with PWN. Please write between 100 and 200 words on why you want to attend the Simmons Leadership Conference and what you hope to achieve from it. Include in your answer which speaker you are most looking forward to hearing from and why. Closing date is October 12th 2018 and full Terms and Conditions are available here.